I solemnly swear I am not intending to take this thread in an awkward direction but wouldn't something designed kinda like a stirrup on the Dr's examination table work? That's basically what this is. However, the flat platform allows the user a couple of different options on how to place their foot or leg. Stirups works great on a bike where we tended to have boots on. This allows for different shoes, Tevas, or barefoot without having the stirup dig into the skin. Drivers side will be available in about 10 days. I will run a special with that as well for a few days. Not to derail but how is that frame carbon fiber? Dipped? That’s amazing. Its actually a piece of real CF that is made for frames to help protect them from scuff/scratch Formed for 1.5" frame. @FauxOperator I believe I used some good quality clear silicone and they have been on there for a while. We are ready to start shipping out the Driver Side footrest for the folks whom have been asking. Still running the special - use code: R-ShotFOOTRest to receive 6% off now through Jan 21st (16 Jan - 21st Jan 2018) Price: $120.00 for the passenger side or the drivers side. Edited once, last by lrobbi ( Jul 18th 2018 ). I gotta tell you guys about my experience with the driver's side footrest from R-Shot Accessories. 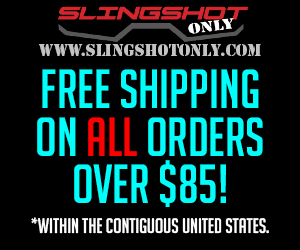 I just completed a 6400-mile roundtrip journey in my Slingshot, with both the driver and passenger side footrest installed. Obviously, I can't speak directly to the passenger side, although my wife likes it, as well as everyone I gave a ride to on my journey. I have mine set up so I can comfortably rest my foot in 3 different positions. On the days when we were filling the tank and driving non-stop to empty, it really helped me stay in the saddle for 2 or 2 1/2 hours at a shot by letting me stretch my hips and back without stopping. It helps get some breeze and cool you off. It's just comfy! Install is a cinch, and the packaging and included tools are spot on. Lewis has a great product here, and his customer service is par excellence. I highly recommend you give him a try! Check him out at http://www.Rshotaccessories.com! The R-Shot Foot Rest is one of my finest accessories. Tested and proven to give your passengers a “leg up” of comfort. It’s made from steel and powder coated with a textured finish. Installation is maybe 35 min. And I PROVIDE THE TOOLS! Please take a look at our video and please subscribed to our YouTube so that you can see all the latest accessories video. 7 Days of Christmas Specials - Coming SOON. R-SHOT Accessories at The Washing DC Armory Car and Bike SHOW! !